You all seemed to like my first Affordable Finds post so I thought I’d follow up with a second part! This is a second part with another mash-up collective haul from Marshall’s and TJ Maxx. Bite Beauty Matte Creme Lipstick in Barberry – This lipstick color isn’t my typical color of choice, but when I saw that they had the Bite Beauty lip formula in Marshall’s, I was excited because they’re so creamy and pigmented! This lipstick’s formula didn’t disappoint and was just as nice and yummy as the other Bite Beauty lip products I’ve tried. If I feel like rocking a berry purple lip, I know which lip product I’m going to try. This particular lipstick formula might be discontinued, but all the lip products I’ve tried from them have been A+ in pigment, texture, (and taste, which is slightly berry as well!) so I do recommend them! Real Techniques Tapered Blush Brush – I never expect anything less than optimal quality from Real Techniques and this brush is no exception! I love using this to apply blush as the bristles are really soft and smooth and they apply blush to a targeted area really well. Plus the rose gold handles are beautiful eye candy and a gorgeous bonus. MAC Pro Longwear Lip Pencil Kit 1 – The Mac Pro Longwear lip pencils are one of my favorite lip pencil formulas and one of my most recommended if you’re the market for them! This set is a great set of neutral staples (except one shade is a very dark red) and they’re just as great as the other MAC Pro Longwear lip pencils I’ve tried. The shades in the set are Staunchly Stylish, Nice ‘n Spicy, and Bittersweet. Clean Sweep Makeup Brush Pad – I’ve heard of the Color Switch that’s at Sephora that you can brush your makeup brushes on to get rid of the color on them to put on a different color for some time, and was intrigued when I saw this more affordable version at TJ Maxx. I’ve tried it with some eye makeup looks and it works just great at removing the extra eyeshadow from the brushes while applying eye makeup. 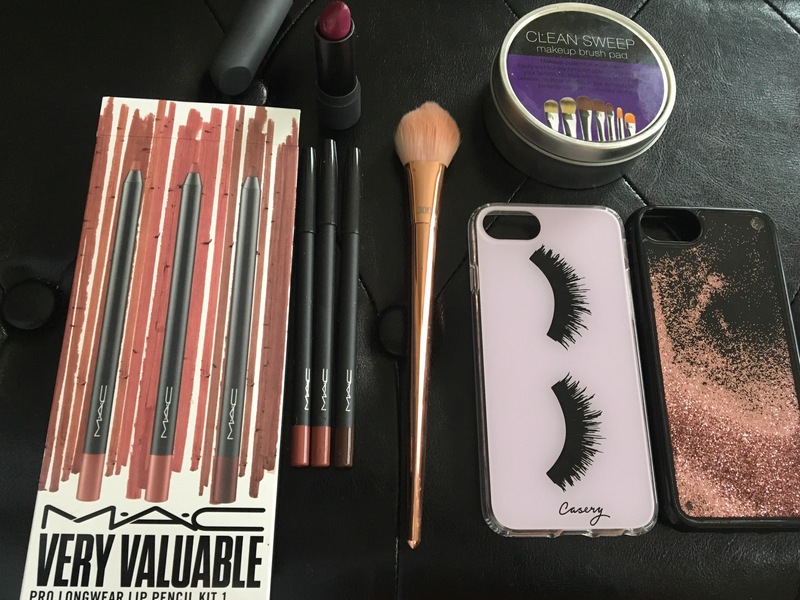 iPhone cases – I’ve been on the look out for some new phone cases and am so glad I got these two because they are so cute! They fit my phone just fine (I have the iPhone 6s for reference).